Finite element analysis helps your business reduce time and costs to complete your aerospace project. Companies choose suppliers that are able to fulfill their delivery requirements on schedule. Simulation can cut costs by reducing the number of prototypes needed to validate the design. Market demands for fuel efficiency have caused aircraft manufacturers to explore the use of new materials such as composites. Reduce risk of error while keeping analysis times at a minimum. A coarse mesh will give you a reasonable idea of the behavior of a structures. However to get more detailed results in areas of interest, you will need more refined mesh. How do you get the level of detail that you need in areas of interest without creating a model that is too large to run? With global / local analyses you can model areas of interest while carrying free body loads from the global model. This allows you mesh and analyze the local model while still under the constraints of the global model. You can then merge the local model back into the global model. This demonstration from our Breakout Models Webinar shows the local modeling of a rib from the global wing model. This webinar explains how to create efficient and accurate breakout models from large structure in order to obtain detailed information of a small detail or interface. 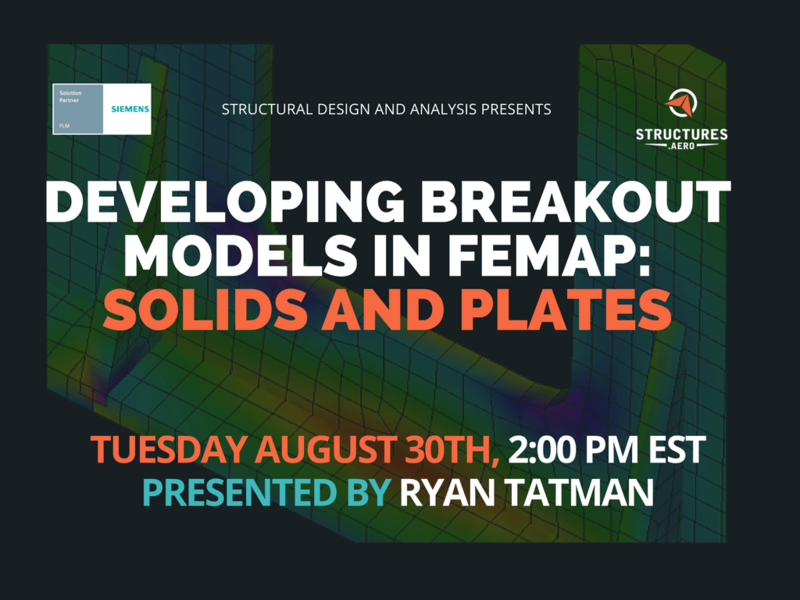 It also covers when breakout models are needed and some common mistakes that can be made when connecting solid elements to plate elements. Efficient composite model creation and results viewing. Typical issues with composite materials modeling involve the method of setting up a ply layup definition. A big part of working with composite materials is simply the ability to see the model, so model visualization is very important for efficient working and to avoid modeling mistakes. 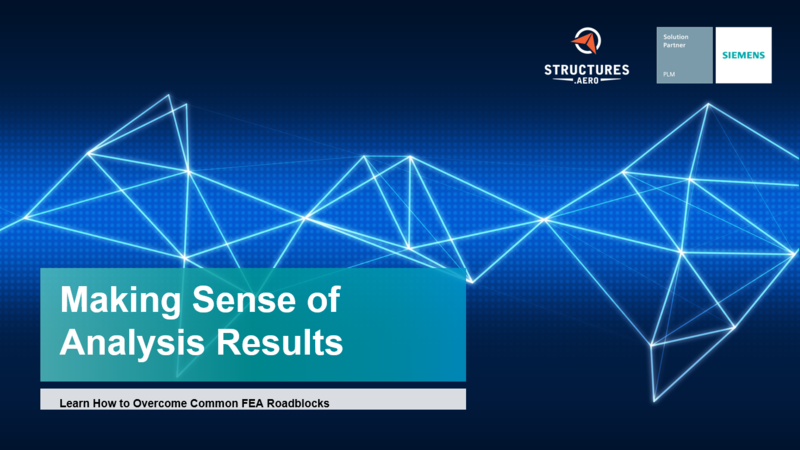 Once the analysis has completed, the ability to view results on the composite structure quickly and efficiently is important. 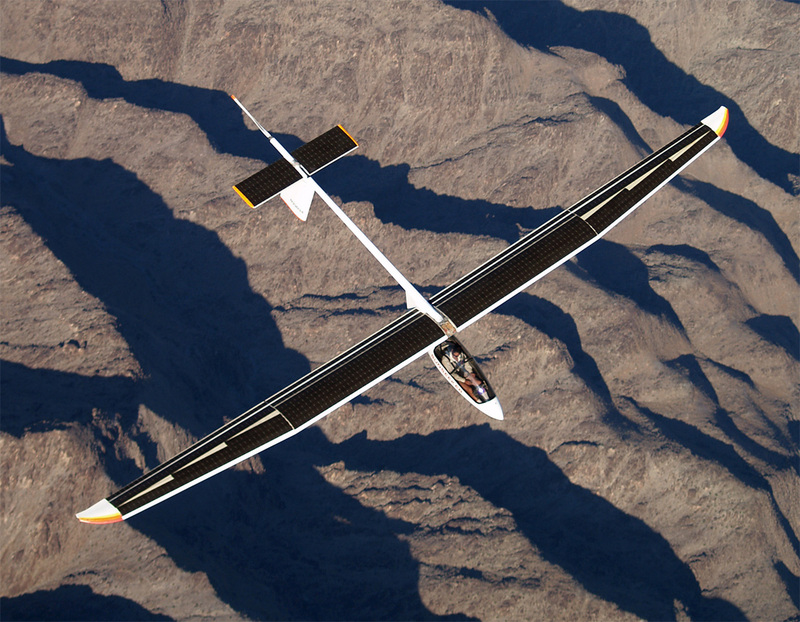 The Solar Impulse 2 became the first solar-powered aircraft to fly around the world. The Solar Impulse team uses Femap with NX Nastran to support all the different types of analysis (strength, buckling, large deformation). Femap contributed to a significant weight reduction of the wing. The wing consists of a Kevlar honeycomb core covered with an advanced carbon fiber material. Since the Solar Impulse 2 flies faster than the first one, its wings had to withstand greater loads. 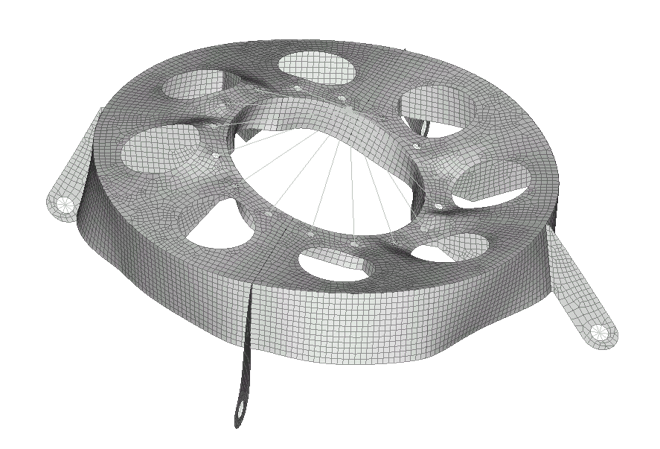 Analysts used Femap to optimize the amount of the carbon fiber plies so that they could meet the needed loading conditions with the least amount of added weight. They were able to go from using a material weighing 100 grams per square meter to one weighing 25 grams per square meter, a significant weight reduction. 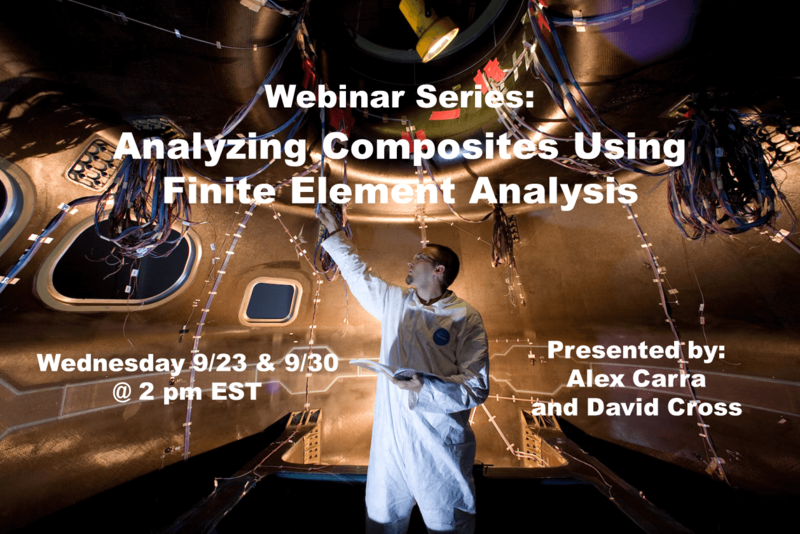 This webinar walks through the modeling and analysis techniques for finite element analysis of composite structures. Higher quality meshes without loss of vital modeling data. 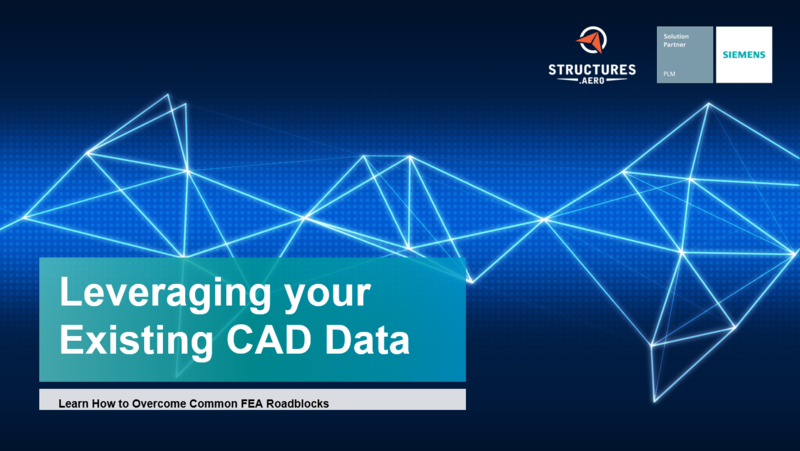 In general, the CAD model contains more information than is required to create a simulation model with details like fillets, chamfers and holes that may be just too small to be of any significance. If left in the model they will lead to the creation of small elements that try to capture the small detail giving rise to overly large FE models. Besides small detail, the CAD model may also contain problematic geometry that can impede the creation of a finite element model. 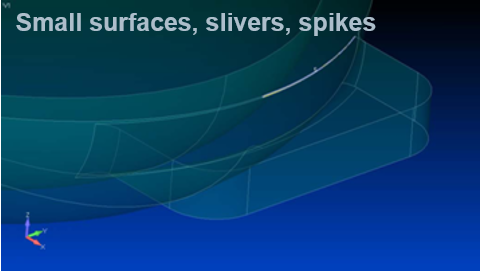 Items such as sliver surfaces, short curves etc. will misguide the FE mesher, if left unheeded, and can lead to the creation of badly shaped elements. Solid element meshes cannot realistically be employed to represent certain modeling topologies, such as thin-walled or frame type structures – the resulting models would be unmanageable. This requires a departure from 3D to 2D, 1D or even 0D finite element types through model idealization. More advanced analyses, like dynamic response and nonlinear, are more numerically intensive and can also require an iterative solution approach requiring multiple solves. Reliance on solid elements to represent the design model can lead to the generation of very large inefficient models that take a long time to run (if they can be run at all), and may limit simulation scope to exclude more advanced types of analysis. This webinar by Siemens PLM demonstrates the tools you can use to import and edit your geometry to serve as the base of your FE model. Reduce solver time while ensuring reliable results. 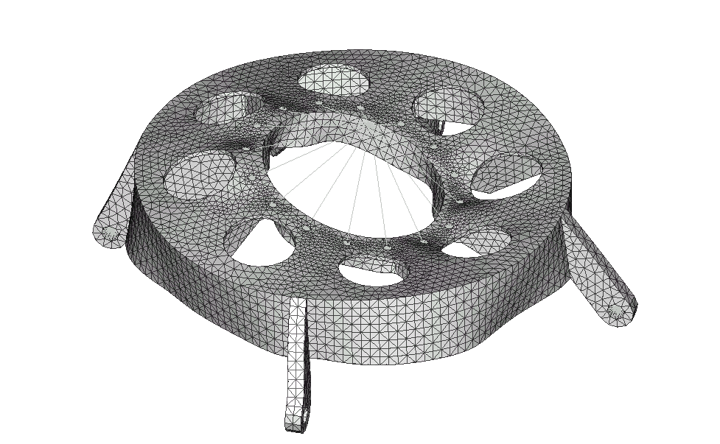 In the creation of a finite element mesh, it is important to create a mesh with well shaped elements – the more distorted the element, the more inaccurate the results that element will display. Badly shaped elements can even stop the solver from completing the analysis. Locating bad elements in a model can be difficult, and fixing them time consuming. Model checkout is important, and a significant amount of time can be saved if errors in the mesh are found before the analysis is submitted, in the modeler where they can be dealt with efficiently. 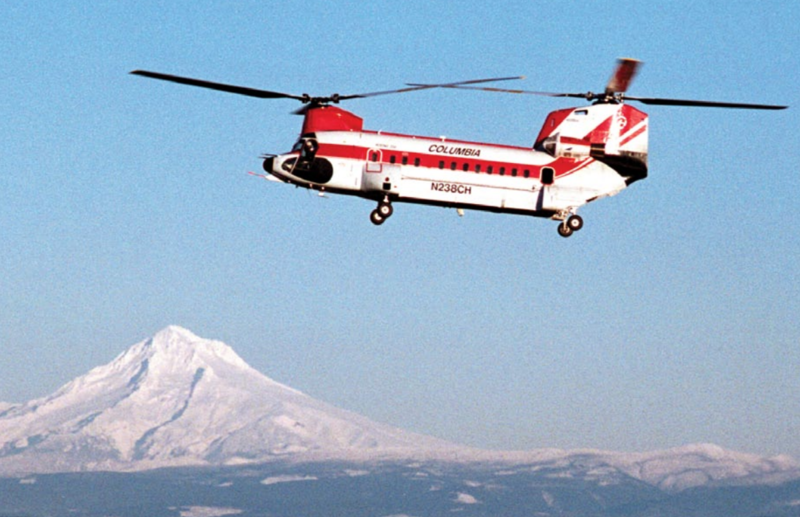 Columbia Helicopters uses FEA using Femap to make their helicopters lighter and to validate maintenance or repair situations with the Federal Aviation Administration. To prepare a finite element analysis, they simply import the CAD geometry into Femap, simplify it as necessary, and then define the analysis mesh. This is done automatically using Femap automatic meshing functionality, and then refined by hand if necessary. At times the analysis will involve a solid object that is represented by tetrahedral elements as well as aircraft skin or stringers that are represented by beam or plate elements. Depending on the part, they can go from importing the CAD model to results within an hour. A larger assembly such as one with aircraft skin and stringers typically takes about one day. This webinar by Siemens PLM demonstrates the tools you can use to mesh your model and apply loads and boundary conditions in preprepartion for solver submission. Access results data faster, visualize the results to understand and explain the results, and export results to third-party programs like Microsoft Excel. As models continue to get bigger the amount of results data produced by the solver also increases. When you also consider performing a more advanced type of analysis such as a dynamic response or nonlinear analysis, then the data created increases even more as these types of analysis produce incremental output data in steps of time, frequency or loading. With a large results database to deal with, the time to access the data increases and the database files themselves become unwieldy and difficult to manage. This gives rise to various challenges such as long import times to read in the results data, increased memory usage in processing the results data, and managing the consequentially large database files. The amount of results data created by the solver can be potentially huge, which makes the task of going through and reviewing the data much more onerous. For the sake of speed, this requires a set of tools that will allow you to review the critical results data efficiently. These tools should also help you comprehend the behavior of the design and allow you to communicate the findings effectively. Often the data that are created by the solver aren’t enough or don’t allow for easy comprehension of model behavior in the original calculated form. So further calculation or extrapolation is sometimes necessary to obtain the desired information. Organization and sorting of data into particular studies can facilitate comprehension of results, in particular locating and comparing maxima and minima across multiple load cases. Interaction with third party programs and tools (such as Microsoft Excel) can also help efficient understanding of model behavior. This webinar by Siemens PLM will detail the tools that you can use to visualize, manipulate, and export the data from your solver.